Born in 1957 on the Wirral, Roy Hodrien studied at the local art college before undertaking further study at Coventry. After a brief period in advertising, Roy began a freelance career as an animal painter and Illustrator, often producing private animal portrait commissions for owners and breeders. As Roy's reputation grew he began to publish several well regarded books on pedigree dogs, featuring over a hundred of his illustrations. He also established a line in copying orientalist paintings for Middle Eastern clients. 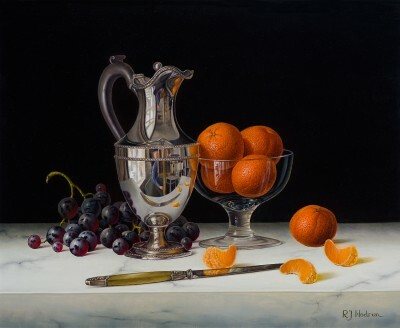 It was in the 1980's that Hodrien started producing his first still life paintings.His passionate interest in the genre led him to study the techniques of the Dutch Masters Willem Kalf and De Heem and the Victorian painters Duffield and Preyer. 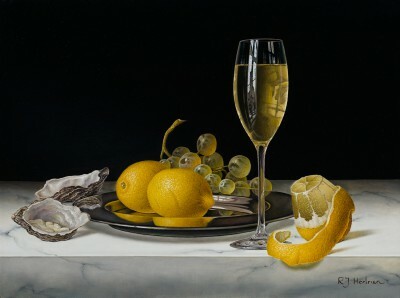 His adaption of traditional techniques to a unique contemporary style has earned Roy an enthusiastic following amongst art collectors worldwide and his paintings can be found in many private art collections.